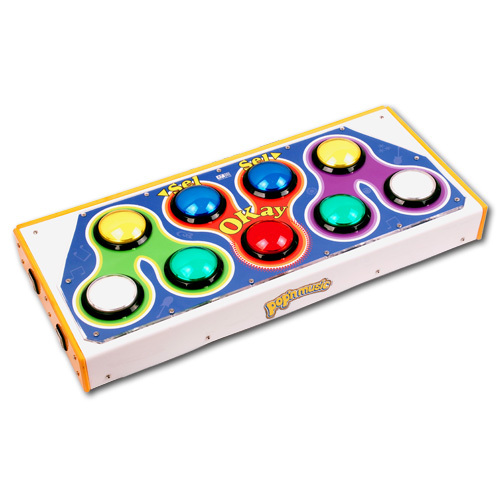 Pop'n music Arcade Style Controller (POP ASC) is the first DJDAO products using AC specifications controller, which is created in 2006. It has experienced 2 times of appearance upgrade and 4 times IC upgrade . POP ASC has AC standard size and panel made by imported acrylic, the surface is smooth and wonderful. Button is designed as arcade button structure, the micro switch using the same efforts as arcade, we choose Omron micro that can be used longer than arcade micro switch. 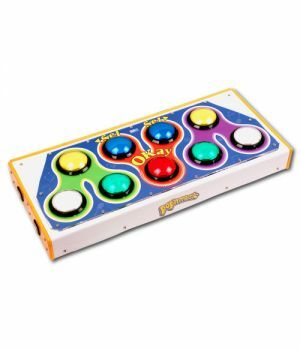 The distance of 9 buttons are the same as arcade. All DJDAO products select custom screws , the appearance parts use SHCS , which is nice and safe. The LOGO of panel is copy from arcade machine, which has exactly the same appearance and effects. To use the latest 2012 models of IC, there are 3 interfaces: 1 PS2 interface , 1 USB A male and 1 USB A female. The USB A female is connected with attached adapter for power supply. For PS2 use PS2 interface to connect, for PC use USB A male to connect . The price of the goods and shipping fee is including the consumption tax. If the order is canceled by personal reasons, 10% of the total amount will be charged as handling fee. When using PayDollar payment method, from the payment day, the refund can be performed within 5 days, but once it is beyond 5 days, the refund can’t be performed. Once the tracking number is generated, the refund can’t be approved.